Durable aluminum panniers that offer an unbeatable value for adventure motorcycling. Powder-coated finish looks great and protects items from unfinished aluminum "blacking". 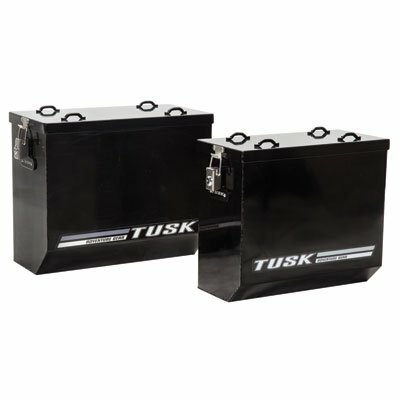 Seamless rear vertical edge design and reinforced welding ensures strength. Complete with 4 (2 on each box) matched locks and keys assembled on the latches. Aluminum lid is completely waterproof and features 4 bolt-on footman loops to secure additional items. Each Large Box is 37 Liters and measures 15 ½" tall, 9 ¼ deep, and 18" wide. A pair of boxes gives you 74 Liters of storage. Each Medium Box is 27 Liters and measures 14 ¼" tall, 7 ½" deep, and 16 ¼" wide. A pair of boxes gives you 54 Liters of storage. Aluminum is .085" thick and each Large pannier weighs a little over 11 lbs., while each Medium pannier weighs just under 9.5 lbs. Designed to be mounted on most brands of pannier racks (mounting hardware not included), but highly recommended with the Tusk Pannier Racks. SOLD IN PAIRS.